In 2000, the first X-Men film introduced us to Wolverine, a mutant with very little knowledge of his past. His mutant powers included a healing factor and three metal claws on each hand. In the sequel, X2, Colonel William Stryker hints at a shared past with Wolverine. Both of these films are set in the present day. In 2009’s X-Men Origins: Wolverine, it was revealed that in the past, William Stryker recruited Wolverine as a part of Team X. He subjected Wolverine to a painful operation that reinforced his skeleton with adamantium, a virtually indestructible metal. In 2014’s X-Men: Days of Future Past, a distant-future team of X-Men sends Wolverine’s mind back in time to the 1970’s to inhabit the body of the Wolverine of that timeline. This 1970’s version of Wolverine has bone claws – so he has yet to be subjected to Stryker’s operation that laces his skeleton with adamantium. Now, here’s where things start to get interesting. Thanks to the events of the time-traveling Wolverine, the X-Men events have been altered. For example, at the end of this movie, Stryker captures Wolverine – presumably, this is the point at which he will soon undergo the adamantium-bonding procedure. 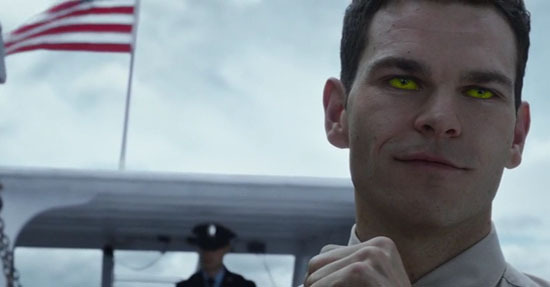 However, now that the events have been altered, at the end of X-Men: Days of Future Past, it’s revealed that Stryker has not captured Wolverine – instead, it is Mystique posing as Stryker that has him. So … how else could the adamantium have been attached to Wolverine’s skeleton? A big clue is that the main villain of this next film is Apocalypse (read our full Apocalypse: X-Men Villain bio) – an ancient mutant that is known for enhancing mutants and recruiting them to be his Horsemen. One of the most notable cases of this is, in the comics, when Apocalypse transformed Angel into Archangel by giving him new, metallic wings whose razor-like feathers he can shoot off like throwing knives. In the film, we know that his Four Horsemen will consist of Magneto, Storm, Psylocke and Angel. We also have seen a recent photo shoot showing Storm in an X-Men uniform alongside the team – this uniform is certainly different than her Horseman outfit. Now, here comes the Cyberspace Comics fan theory! Let’s say Storm defects to the X-Men, leaving a void to be filled in the Horsemen. 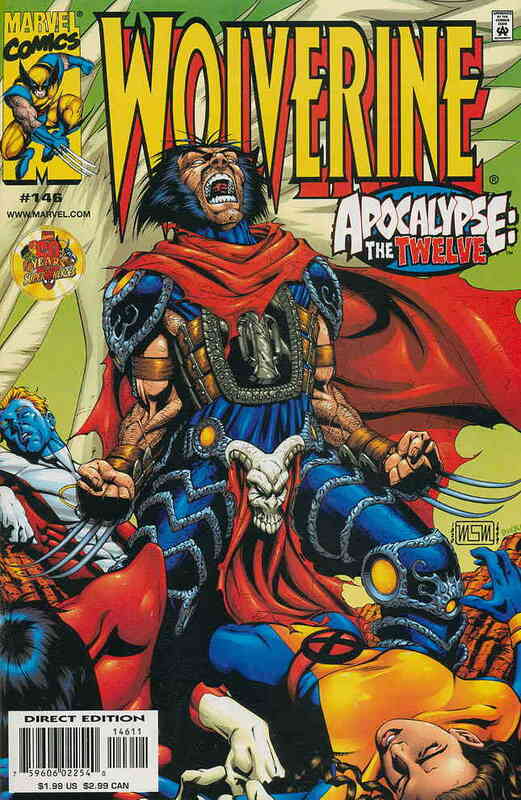 Looking to fill that void, Apocalypse recruits Wolverine and enhances him with an adamantium-laced skeleton. This provides us with a perfectly good explanation of how Wolverine gets his adamantium back and fits in nicely with the Apocalypse storyline. Now, mind you, this theory doesn’t just come out of nowhere. There’s certainly basis for it in the comics themselves. In Astonishing X-Men vol. 2 #1 (cover date: September 1999), a new Horseman of Death is introduced. And, in X-Men vol. 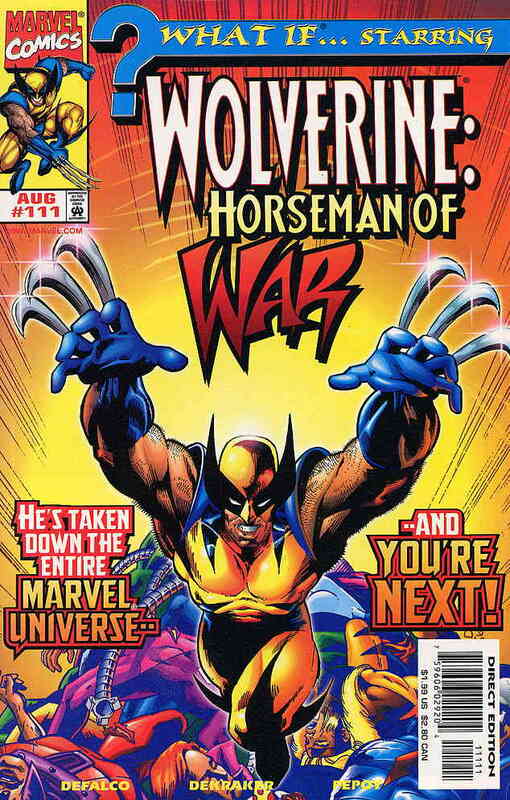 2 #95 (cover date: December 1999), that Horseman was revealed to be Wolverine. That very same month, in Wolverine vol. 2 #145, it was revealed that Apocalypse had taken the adamantium-free Wolverine (Magneto ripped the adamantium out of him in Wolverine vol. 2 #75) and enhanced him with the rare metal – turning him into Death. Could the movie be following this very same path of reintroducing Wolverine’s adamantium via Apocalypse? 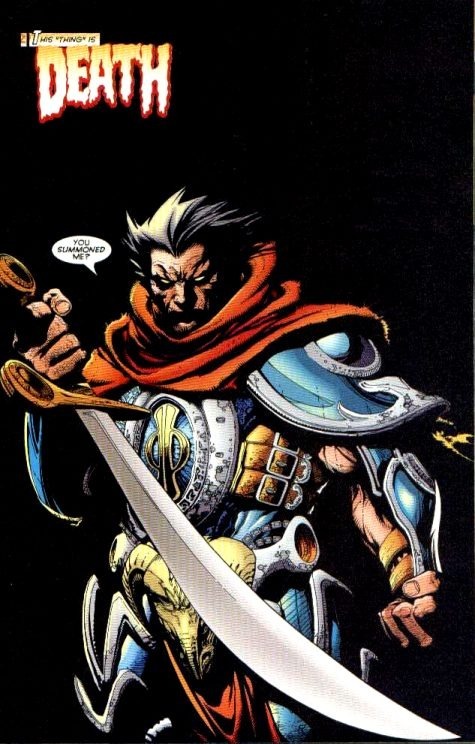 If so, is Wolverine going to be a Horseman of Apocalypse? It’s certainly possible – and would make for a great addition to the Apocalypse and Wolverine storyline in the X-Films. If that happens, I expect a strong uptick in demand for the issues wherein Wolverine is the Horseman of Death. Those issues are Astonishing X-Men vol. 2 #1-3, Wolverine vol. 2 #145-147, and X-Men vol. 2 #95. And, even though it’s not in-continuity, I’d also look to What If? vol. 2 #111. May 27, 2016 is fast approaching – the release date of the newest X-Men movie! The main villain in this film is going to be Apocalypse – so let’s take a look at the important moments in Apocalypse’s history. X-Factor #6 is the big one. 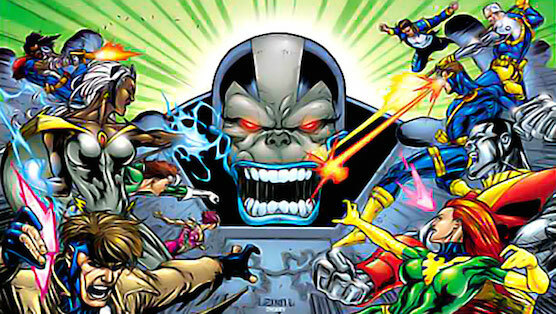 It features the fist full appearance of Apocalypse. In this book, Apocalypse explains that he’s been around for centuries and espouses his goal of pitting mutant against mutant in the hopes of pinpointing the strong. He also explains (and demonstrates) his ability to re-arrange and re-structure his body’s molecules. Earlier, I specified that X-Factor #6 was Apocalypse’s “first full appearance”. I had to make that distinction because he made a cameo in X-Factor #5. It’s not nearly as important as his first full appearance but it will certainly be in-demand for those scooping up Apocalypse books. 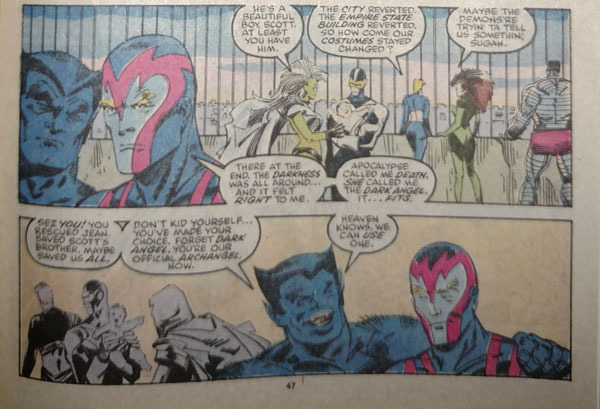 Additionally, it’s the first appearance of the Alliance of Evil although, two of its members debuted earlier: Tower (in X-Factor #2) and Frenzy (in X-Factor #4). It should be noted that while this is the first group that we see Apocalypse leading, I don’t have much hope for this being the group that he commands in the film. Did I say X-Factor #6 was his first appearance? Well, this is where things start to get a little tricky. In Uncanny X-Men #376, Apocalypse verifies that he was the mysterious benefactor that helped out the Living Monolith. 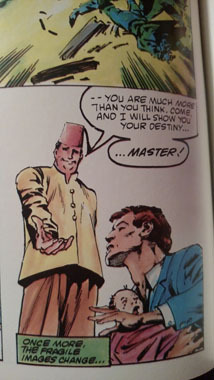 This happened in a graphic novel from 1985, which predates X-Factor #6 (or #5, for that matter). Now, it’s quite clear that the writer of that graphic novel (Revenge of the Living Monolith) never intended it to be Apocalypse but, that hasn’t stopped collectors from scooping it up. 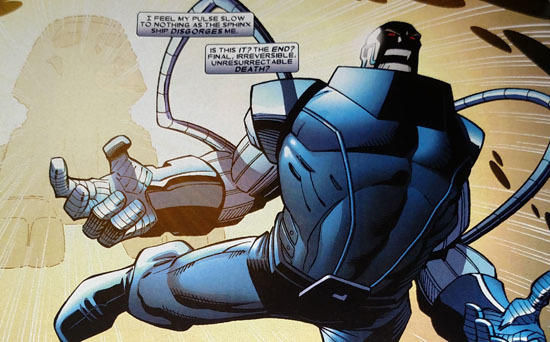 So, technically, it is the first published appearance of Apocalypse – albeit, not in a form he’s famous for. It’s worth pointing out that there’s a second printing of this graphic novel, easily identified by its cover price of $9.95 (the first printing was $6.95). 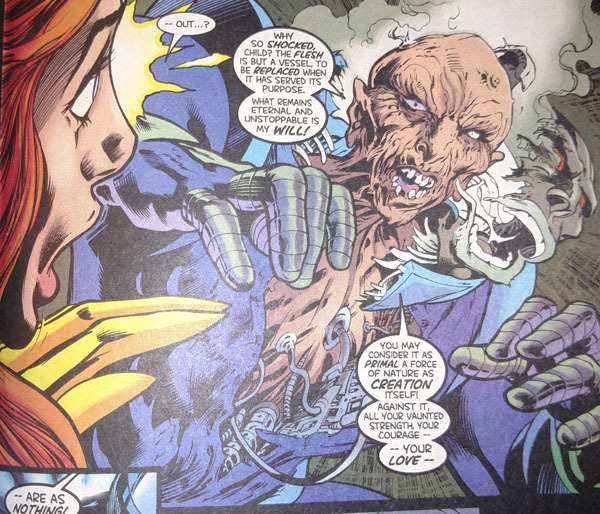 Apocalypse’s second appearance is in X-Factor #10 (on one page), wherein he recruits the Morlock, Plague, to become his first Horseman: Pestilence (although, we do not yet see what Pestilence looks like). This issue is also significant because it’s where the Marauders pin Angel to the wall by his wings. That event led to their amputation in X-Factor #14. X-Factor #14 is also significant because it’s the first mention of the Twelve – a group of mutants who are essential to Apocalypse’s plan to gain omnipotence (this storyline kicked off in Uncanny X-Men #376 … more on that later). In X-Factor #11, Apocalypse makes his third appearance as he recruits Abraham Lincoln Kieros to be his second Horseman: War. Again, we don’t see what War looks like, just yet. And, in #12, he recruits a young girl named Autumn Rolfson to be Famine. Finally, in X-Factor #15, we see what the Horsemen of Apocalypse look like after they’ve been transformed. 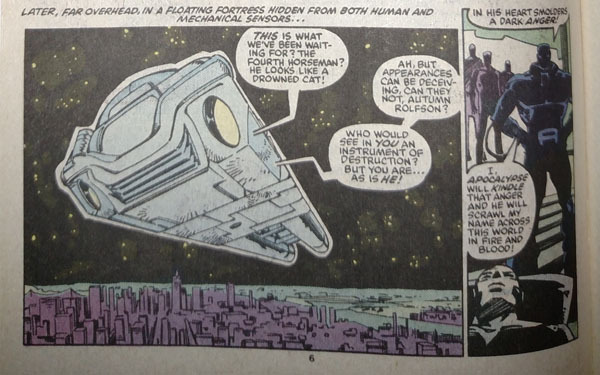 This issue also marks the first appearance of Apocalypse’s Ship – a sentient ship whose ancient A.I. program was created by Celestials. “Ship” later became X-Factor’s headquarters and, after that, took on a humanoid form and was called Prosh. As for the movie, I doubt Ship will be a prominent part (if any part) but, this is an important book to get since it debuts three of the four Horsemen. The concept of the Four Horsemen was already briefly seen in the end-credit sequence of X-Men: Days of Future Past and will play an important role in the upcoming X-Men: Apocalypse film. The four roles of the Horsemen are stable but the characters filling those shoes have continued to change since they first debuted nearly 30 years ago. X-Factor #17 features a one-panel, shadowy cameo by the Horsemen and Apocalypse as he looks down upon his fourth recruit (but we don’t yet know who it is; nor has he been transformed yet). This issue is also the first appearance of Rictor. In X-Factor #18, Apocalypse starts the transformation of his fourth recruit into Death. We notice that this recruit has blonde eyebrows and says, in regards to the painful transformation process: “I can bear it … anything … anything to fly again –“. The Horsemen of Apocalypse make their cover debut on X-Factor #19. In that issue, Apocalypse is shown commenting to his fourth recruit that Death’s wings are already growing. It’s also the first time that we see the Horsemen in action as they battle against X-Factor. Death makes his first cameo after his transformation has been completed in X-Factor #21. It’s a brief, one-panel cameo – and his wings are not shown but, he’s adorned in the Horseman uniform. Another shadowy cameo in X-Factor #22 reveals that Death has wings. 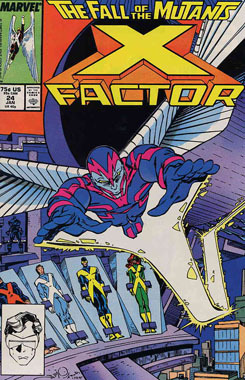 X-Factor #23 is considered by many to be just a cameo of Death – but it is a full-body shot and the character sees a bit of action and has some dialogue, as well. The big Death reveal is in X-Factor #24. It’s the first cover appearance and considered by most to be the first full appearance of Warren Worthington III as Death (he is later given the name Archangel by the Beast in X-Factor #38). In this issue, Apocalypse reveals that he lived in Ancient Egypt (he claims the Egyptians called him Set), Persia (where he was called Sauru), India (where he was called Kali-Ma) and that the Aztecs called him Huitzilopochtli. This is the moment where X-Factor (and we, the readers) learn that Death is their former teammate, the Angel. It’s also the issue where Caliban defects and joins Apocalypse (in his quest for power to gain vengeance on those who killed his fellow Morlocks). The showdown against Apocalypse and his Four Horseman continues in X-Factor #25, wherein we see: the death of Pestilence, Death defects against Apocalypse and Apocalypse abandons Ship. In the following issue (X-Factor #26), we see that Caliban is now dressed in a Horseman costume. He has yet to be transformed, though. Later, Apocalypse prompts him to begin the process in X-Factor #28 but we don’t see the finished product until X-Factor #50 (Apocalypse refers to him as Hell Hound in this issue). In the same month as X-Factor #26, Famine fought against the Falcon, D-Man, Nomad and the Captain in Captain America #339. 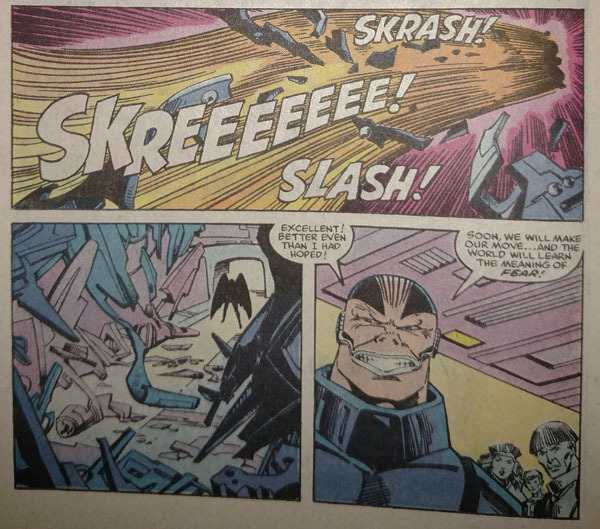 A few months after that, Apocalypse battled the High Evolutionary over conflicting views on how to achieve “Survival of the Fittest” in X-Factor Annual #3 (an Evolutionary War tie-in from 1988). And, when Classic X-Men #25 reprinted X-Men #119 (cover date: March 1979), they added a new scene wherein Apocalypse endows Moses Magnum with superhuman powers. In X-Factor #49 & 50, Loki invites Apocalypse to participate in his Acts of Vengeance (a storyline where Loki pits villains against heroes that are unused to their abilities). 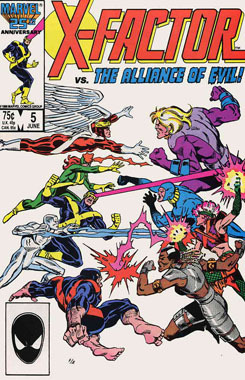 Issue #50 (cover date: January 1990) features a seldom-seen battle between Apocalypse and Loki. 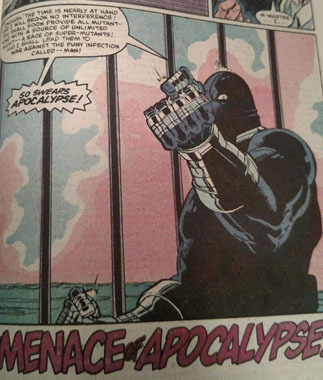 Apocalypse was briefly seen in a cameo in Fantastic Four #335 (cover date: December 1989), the second part of their Acts of Vengeance tie-in. In X-Factor #51, we see that Apocalypse and his Hell Hound (Caliban) are in a citadel beneath the Himalayas, keeping track of the goings-on in Manhattan. When he notices Sabretooth on the screen, Caliban requests that Apocalypse sends him to New York so that he may take revenge on Sabretooth for killing his people, the Morlocks. When Apocalypse refuses, Caliban takes it upon himself to disobey his master and leaves anyway. A battle with Sabretooth in X-Factor #52 left Archangel severely wounded. In X-Factor #53, Sabretooth’s spoor led Caliban to the wounded Archangel, who lashed out against the Hell Hound as he came to. This led to a battle between the two that ended with the police driving Caliban off. In X-Factor #65 (cover date: April 1991), we meet Apocalypse’s Riders of the Storm (later referred to as the Dark Riders: Foxbat, Gauntlet, Tusk, Psynapse, Barrage and HardDrive) as he sends them to take his revenge upon Ship for betraying him. This issue also contains three entries from the Apocalypse Manifesto – Apocalypse’s personal files. The entry on Cyclops refers to him as the “father-spawn of the Twelve, the archetype beings who will one day save or damn muantkind.” In X-Factor #66, during the raid on Ship, Foxbat kidnaps Nathan Summers (Cyclops’ infant son). This issue sees the debut of Sister Askani, the death of Ship, due to a self-destruct sequence introduced by the Dark Riders, and more Apocalypse Files. In X-Factor #67 & 68, the team joins with the Inhumans to take on the forces of Apocalypse. 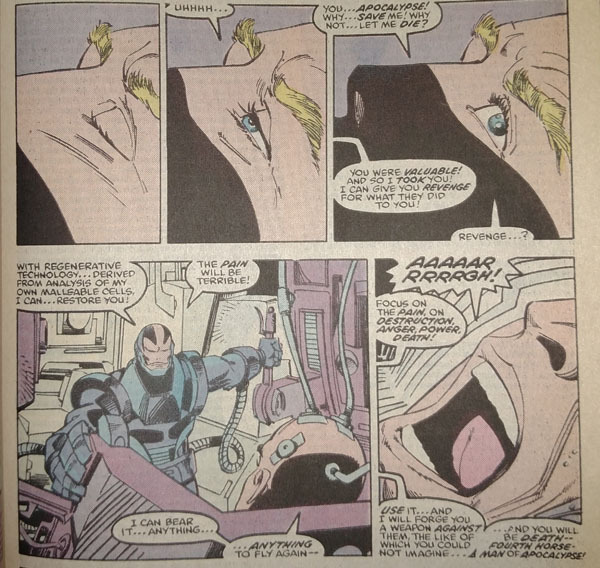 Before Cyclops is able to defeat Apocalypse with a powerful optic blast (wherein he is believed to possibly be dead), the villain has infected Nathan Summers with a techno-organic virus. In order to save Nathan, Cyclops allows Sister Askani to take him to the future where they have the capacity to save him from being killed by the virus. We learned about young Nathan growing up in a future world ruled by Apocalypse in the Adventures of Cyclops and Phoenix #1-4 (cover date: 1994) and Askani’Son #1-4 (cover date: 1996). In Namor, the Sub-Mariner Annual #3, Apocalypse kidnaps Namor and attempts to re-make him into a servant. 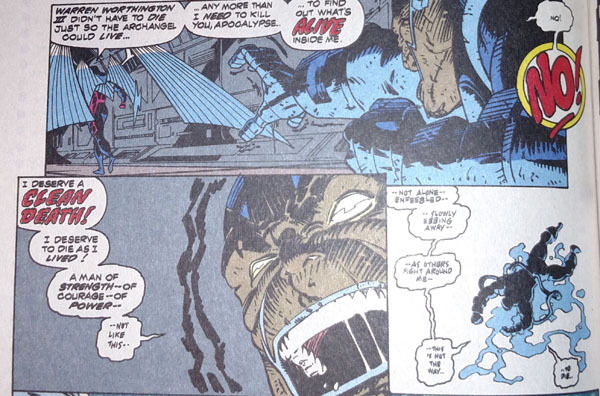 The next major storyline involving Apocalypse was called X-Cutioner’s Song and ran from November 1992-January 1993. Each of the 12 parts originally came polybagged with a card. 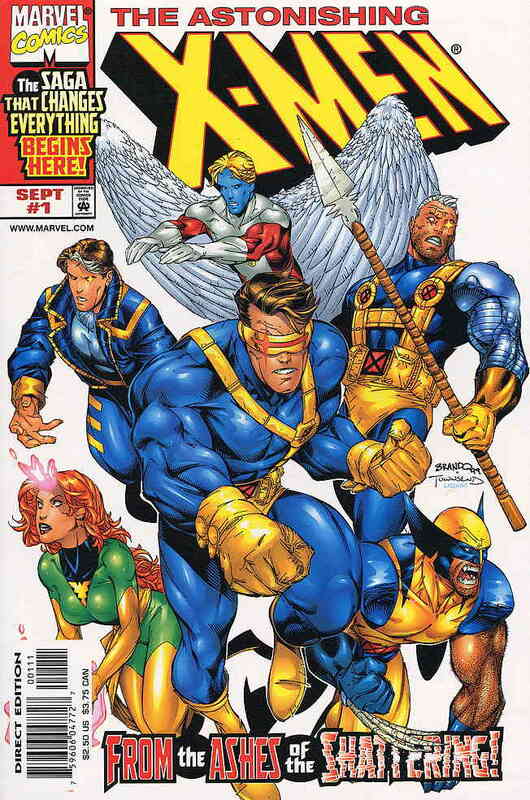 Uncanny X-Men #294 – the Horsemen of Apocalypse launch an attack against the X-Men. Caliban is now the Horseman, Death. 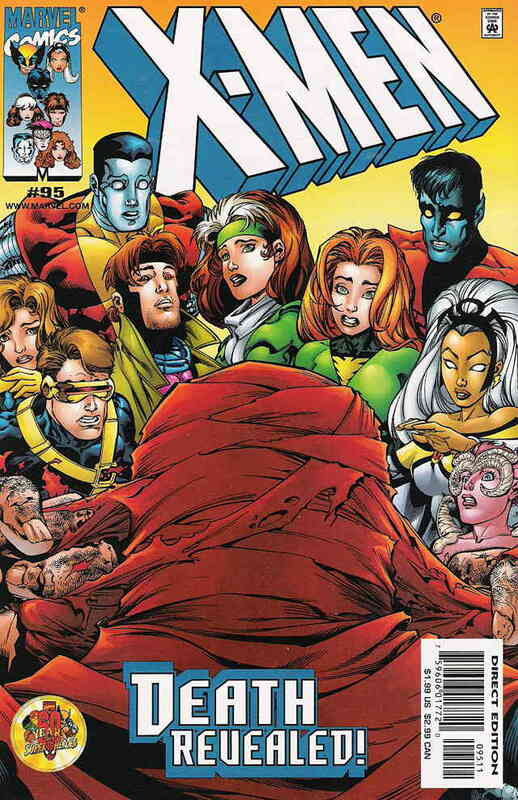 X-Factor #84 – The Horsemen of Apocalypse kidnap Cyclops and Jean Grey for Mr. Sinister (disguised as Apocalypse). 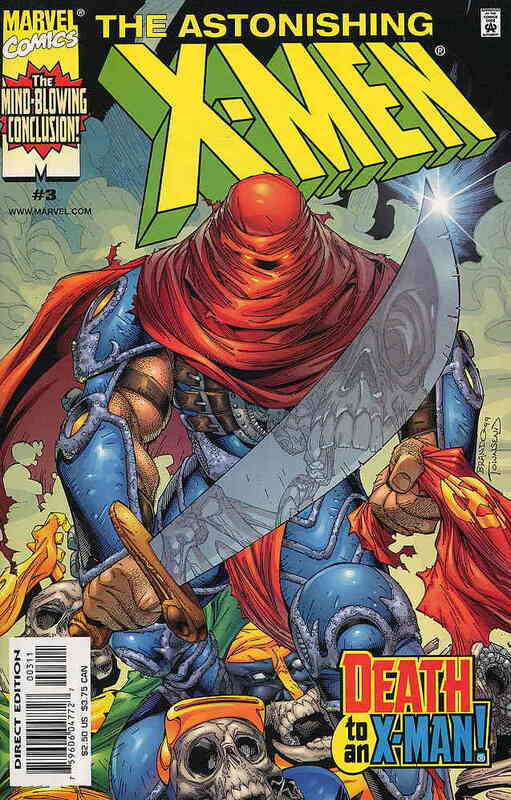 X-Men #14 – The Dark Riders travel to Egypt and awaken Apocalypse from his healing chamber. They explain that someone has been manipulating his Horsemen of the Apocalypse. This is the first time we discover that Apocalypse was not killed by Cyclops’ optic blast (see X-Factor #68). Uncanny X-Men #295 – a weakened Apocalypse battles the X-Men, defeats them and then teleports away. X-Factor #85 – Apocalypse invades one of Cable’s safehouses in Switzerland and discovers technology there derived from his own work. He begins to unravel the truth of Cable’s identity. X-Men #15 – Styfe hunts down Apocalypse and defeats his Dark Riders. X-Force #17 – In a battle against Stryfe, Apocalypse manages to teleport to safety just as he is nearly killed. 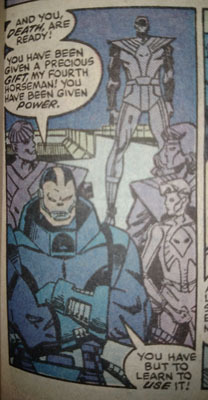 He arrives at Xavier’s Mansion and proposes teaming up with the X-Men to defeat Stryfe. Uncanny X-Men #296 – Apocalypse explains that he can save Charles Xavier from the techno-organic virus that Stryfe infected him with and Archangel vouches for his ability to do so. 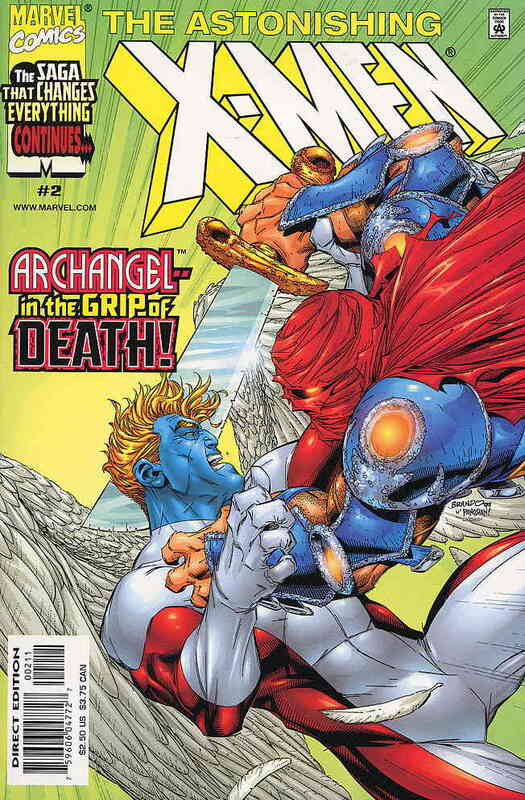 X-Factor #86 – a tense interaction between Apocalypse and Archangel as the villain is recruited to work with the X-Men to stop Stryfe’s techno-virus. 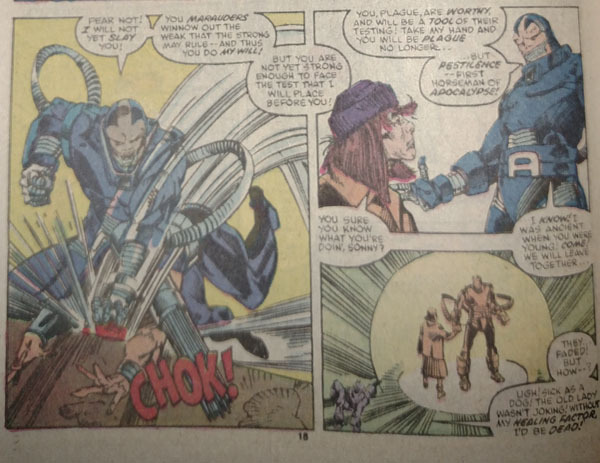 Later in the issue, Apocalypse expunges the virus from an unconscious Charles Xavier. X-Men #16 – Considering Apocalypse to now be one of the “weak”, the Dark Riders turn on him! X-Force #18 – A near-dead and dying Apocalypse begs Archangel to grant him a clean death. However, Archangel refuses and leaves him to die. X-Force #37 (cover date: August 1994) begins with a flashback showing Apocalypse in the 1100’s. It reveals his name as En Sabah Nur (although the name of En Sabah Nur was hinted at earlier in Cable #6 [cover date: December 1993]) and shows the moment he discovered the space craft that forever altered him. In Cable #19 (cover date: January 1995), Cable, Storm and Caliban tracked the Dark Riders to Akkaba, Egypt (the birthplace of En Sabah Nur) and discovered they are now being led by Genesis (Tyler Dayspring; Cable’s son). With their former leader presumed dead after the events of X-Cutioner’s Song, they’ve found new purpose under Genesis. However, at the end of this issue, it appears as if Apocalypse might not be dead after all. Genesis and his Dark Riders capture Wolverine and in Wolverine #100 (cover date: April 1996), Genesis attempts to transform Wolverine into the Horseman, Death, by reintroducing adamantium onto his skeletal structure (Magneto had forcibly removed the adamantium from his bones in Wolverine #75). Wolverine rejects the adamantium and is transformed into a more bestial state. The following month, in Uncanny X-Men #332 and Wolverine #101, the X-Men battle against Ozymandias, an Egyptian Lord that once defied Apocalypse, only to later become his scribe. Ozymandias discovers that Apocalypse has emerged renewed from his stronghold in Uncanny X-Men #335 (cover date: August 1996). Apocalypse and Uatu the Watcher observe the chaos Onslaught is causing in Fantastic Four #415 (cover date: August 1996) and in Uncanny X-Men #336 (cover date: September 1996), as they are conversing, they determine that Cable may one of the only things that can stop it. In Cable #35 (cover date: September 1996), Apocalypse joins Cable and the Invisible Woman in an unsuccessful attempt to stop Onslaught. 1996’s the Further Adventures of Cyclops and Phoenix took place in London 1859. In that series, a gang of unsavory characters calling themselves the Marauders stumble upon Apocalypse as he awakens from his “hibernation”. They lead him to an associate of theirs, Nathaniel Essex, a brilliant scientist who foresees the introduction of mutants within the next century. 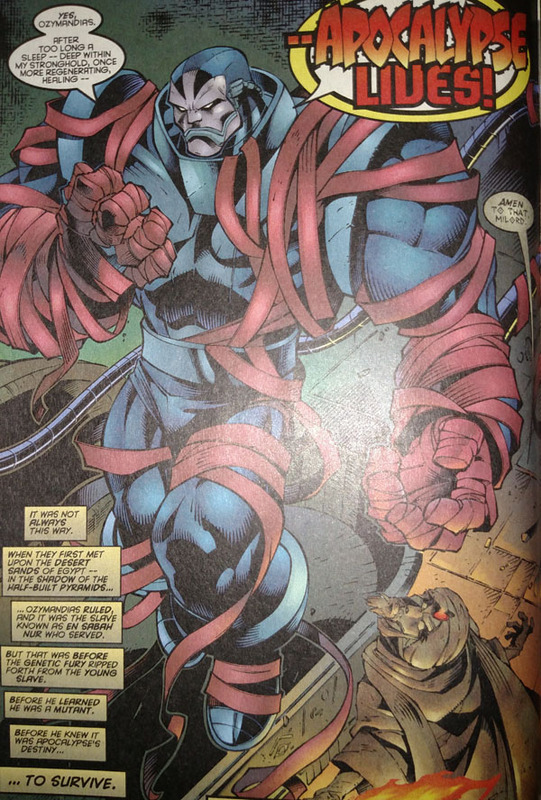 Apocalypse transforms Nathaniel Essex into Mister Sinister before he re-enters his “hibernation”. 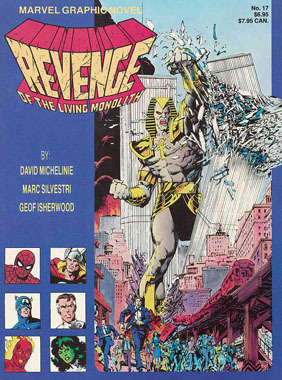 Immediately following the conclusion of that mini-series, Marvel began publishing the Rise of Apocalypse, which revealed Apocalypse’s origin. December 1996’s Black Knight: Exodus #1 takes place during the Crusades and shows the origin of Exodus, as he is transformed by Apocalypse. Cable #-1 (cover date: March 1997) revealed that when Cable was sent back in time, it sparked Apocalypse’s awakening in the 20th century. This story pre-dates X-Factor #5 & 6. Apocalypse transformed the Hulk into the Horseman, War, in the Incredible Hulk #456 & 457 (cover date: September 1997). It took the combined efforts of Juggernaut and the Absorbing Man to defeat the Hulk, afterwards he freed himself from Apocalypse’s power implants. In Cable #53 (cover date: April 1998), Apocalypse reveals he’s planning something big but to do so, he must be alone so he releases Ozymandias from his servitude. Later, in Cable #66-68 (cover date: April-June 1999), Ozymandias reveals to Blaquesmith that Cable is to be the Gatherer of the Twelve. 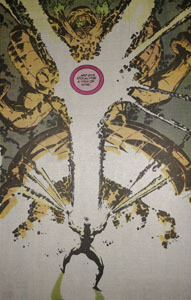 Ikaris of the Eternals interrupts some of Apocalypse’s machinations in the New Eternals: Apocalypse Now #1 (cover date: February 2000). A new horseman, Death, debuts in Astonishing X-Men vol. 2 #1 (cover date: September 1999). After prolonged battles with the X-Men, Death kills Wolverine in Astonishing X-Men vol. 2 #1 (cover date: November 1999). The X-Men discover that the now-dead Wolverine was actually a Skrull impersonating their teammate, in Uncanny X-Men #375 (cover date: December 1999). And, in X-Men #95 (cover date: December 1999), the newest horseman of Death is revealed as Wolverine! A flashback in Wolverine #145 illustrates how Apocalypse captured Wolverine and Sabretooth. He had the two of them battle it out to see who would take over the role of his Horseman, Death. Wolverine won and Apocalypse removed the adamantium from Sabretooth and implanted it into Wolverine (you may remember that Magneto removed the adamantium from Wolverine in Wolverine #75). Over in Cable #73 (cover date: November 1999), Caliban is now calling himself Pestilence and in #74 (cover date: December 1999), Deathbird is going by War. This mini-series and the issues I just talked about form a direct prologue to the next major Apocalypse storyline, entitled Apocalypse: the Twelve. Uncanny X-Men #376 – Apocalypse subjugates the Living Monolith and reveals that his plan is nearing fruition. Meanwhile, Xavier has discovered Destiny’s diary which reveals the identity of the Twelve: Xavier, Cyclops, Phoenix, Storm, Iceman, Sunfire, Polaris, Cable, Bishop, Mikhail Rasputin, the Monolith and Magneto. X-Man #59 & 60 – Pestilence captures Nate Grey and brings him to Apocalypse. Cable #75 – Apocalypse has captured Cable. This issue is rather inconsequential for the crossover but it does feature two large battles: Cable vs Death (Wolverine) and Cable vs Apocalypse. X-Men vol. 2 #96 – the Horsemen of Apocalypse capture Iceman, Mikhail Rasputin and Sunfire. 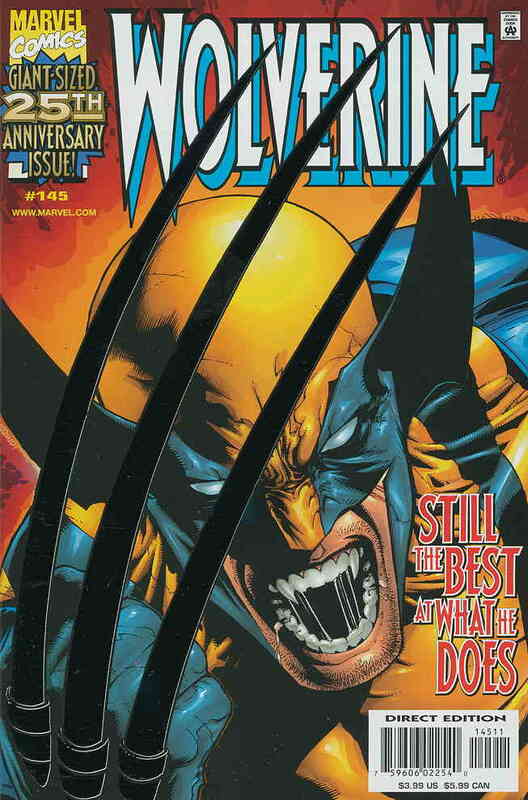 Wolverine #146 – the X-Men battle against Death (Wolverine) and manage to free him of Apocalypse’s influence. Wolverine #147 – the Angel visits Abraham Kieros (formerly War; now a quadriplegic) and uses his healing power to enable Kieros to walk again. Uncanny X-Men #377 – the X-Men travel to Egypt in an attempt to free their friends. However, in the battle against Apocalypse’s forces, the final members of the Twelve are captured. Apocalypse reveals to them that he intends to use their powers together in order to transform him by endowing him with power greater than the Celestials. Cable #76 – Madelyne Pryor offers to free Cable if he will abandon the other Twelve to Apocalypse but he declines her offer. X-Men vol. 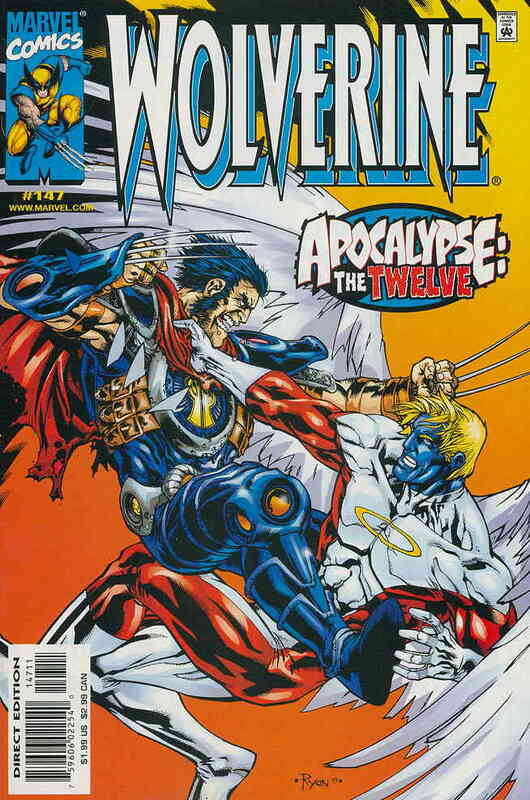 2 #97 – As Apocalypse begins to siphon power from the Twelve, he initiates a process to take over Nate Grey’s body. He believes Nate to be the most powerful mutant on the planet and thus the only form that can contain the power he intends to accumulate. 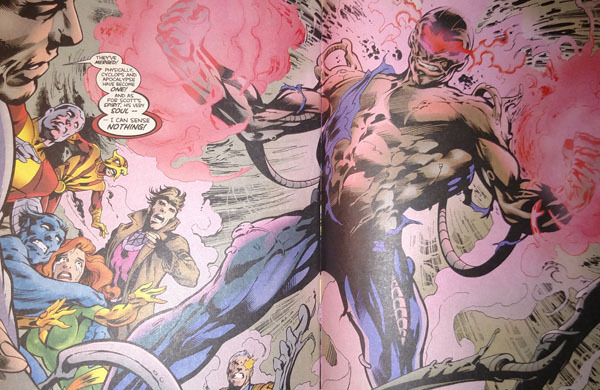 Cyclops interrupts the process by throwing himself in between Apocalypse and Nate – the end result is a Cyclops/Apocalypse hybrid. In X-Men vol. 2 #181 (cover date: March 2006), Apocalypse is re-awakened from his rejuvenation chamber due to the drastic reduction in the number of mutants after the events of House of M. In a Blood of Apocalypse prequel, Cable & Deadpool #26 & 27 explains how Apocalypse was regenerated from a blood sample of his that Ozymandias had kept. X-Men vol. 2 #182 – Apocalypse commands Gazer and Dr. Foster to battle to the death. The winner will become his horseman, War. 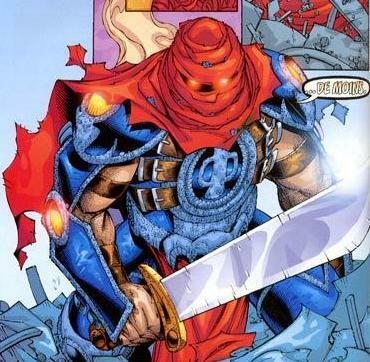 He leaves them to fight it out in order to recruit Sunfire as another horseman. The Japanese mutant has recently lost both of his legs – and Apocalypse offers to make him whole again. Back in Apocalypse’s sphinx-shaped fortress, Dr. Foster is killed in battle by a sneak attack from Ozymandias. X-Men vol. 2 #183 – Apocalypse approaches Xavier’s Mansion, which is now housing the remaining 198 mutants of the world, and asks them to join him. Before he unleashes pestilence upon the world, Apocalypse offers an antidote up for the mutants to freely drink. He intends to unleash a plague upon the world that will drastically reduce the number of humans – just as the number of mutants has been reduced down to only 198. One of the mutants that decides to join Apocalypse is Gambit! X-Men vol. 2 #184 – Ozymandias betrays Apocalypse by leading the X-Men into the Engine Chamber of Apocalypse’s sphinx-ship. As they come face to face with Apocalypse, he reveals that he has transformed Gambit into his horseman, Death. X-Men vol. 2 #185 – The X-Men’s raid on Apocalypse’s sphinx-ship leads to the destruction of the majority of the antidote. 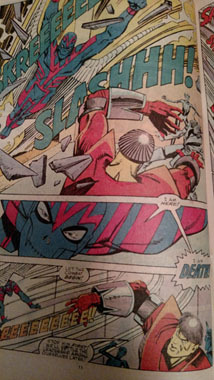 Sunfire defects from the Horsemen just prior to Apocalypse’s retreat. Apocalypse descends upon the United Nations and demands that the humans willingly kill off 90% of their people. If this is not done within a week, he threatens that he will unleash a pestilence that will kill all humanity. On the last page, we learn that the horseman, Pestilence, is Polaris. 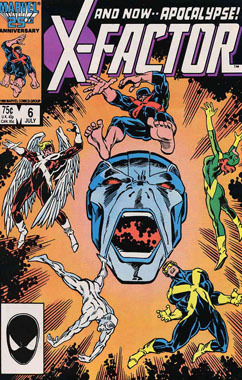 At the same time the Blood of Apocalypse storyline was running in the present, the mini-series X-Men: Apocalypse vs Dracula was published. It featured flashbacks to two different time periods. The first flashback takes place in Romania, in the year 1459. During this time of the Crusades, Vlad Tepes and his forces are wiped out by Apocalypse and his Riders of the Dark. Then, in London, in the year 1897, Apocalypse is awakened to learn that Clan Akkaba members (followers of Apocalypse) are being slaughtered by vampires so he unites with Abraham Van Helsing to take down Dracula. After Dracula is defeated, Apocalypse returns to his hibernation. Throughout the years, many others have taken on the roles of the Horsemen. With the movie on the way, there are some back issues that will heat up in demand (and, therefore, price). 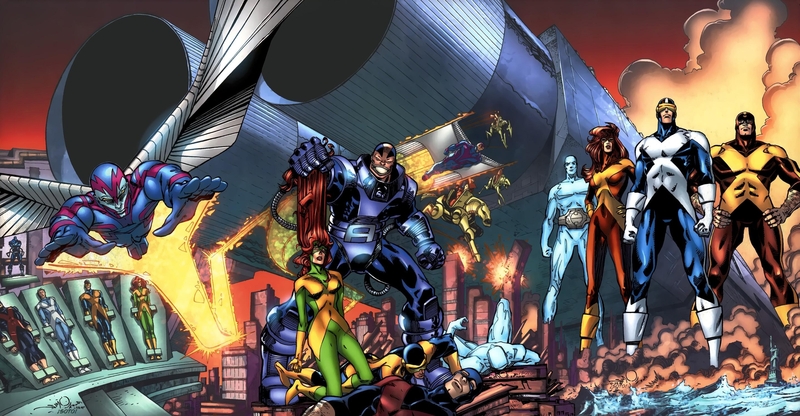 The safe bets for increased demand are the first appearances of Apocalypse (X-Factor #5 & 6), the first appearance of the Horsemen (X-Factor #15) and the first full appearance of Death/Archangel (X-Factor #24). Origin stories typically increase in demand in situations like this, too – so I’d look to the Rise of Apocalypse mini-series (and possibly X-Force #37). After first appearances and origins, two other types of stories sometimes experience increases in demand: important storylines and big battles. On the storyline front, I’d look to the Twelve and the Blood of Apocalypse to heat up, along with the storyline from X-Factor #65-68. As for battles: X-Factor #50 (vs Loki), Incredible Hulk #456-457 and X-Men: Apocalypse vs Dracula have my votes. For the purposes of this article, I’m not getting into robot-duplicates, clones, alternate realities or future timelines featuring Apocalypse . But those are all rabbit-holes that one could wander down when exploring the character. Though he’s regarded as a major X-Men villain, he really hasn’t had all that many important storylines (again, I’m exluding alternate realities, future timelines, etc). But, I think that’s probably for the best. Apocalypse works best as a threat that is not-yet-realized. Always planning. Always manipulating. And, destined to one day conquer the world. But, not today … if the X-Men can help it. From October 2015 to February 2016, eBay was giving away 10,000 free listings to sellers with store accounts. Despite the elimination of this promotion, the number of listings have dipped but not dropped off sharply. Atomic Avenue‘s total listings are continuing their slow climb out of their most recent 5-year low brought on by a combination of increased selling fees and stricter selling metrics that removed some members (other members left proactively). This month, that slow climb took a slight hit. However, more importantly, their number of unique issues continues to rise consistently – and has done so since I began tracking this data. 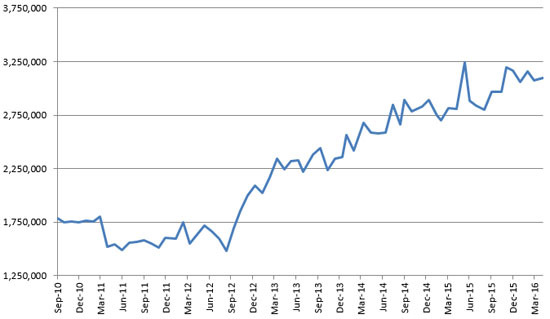 Comic Collector Live continues to see consistent growth in their user base. Amazon‘s collectibles marketplace is too new to draw any conclusions – as is the recently-launched HipComic, which debuted in January 2016. 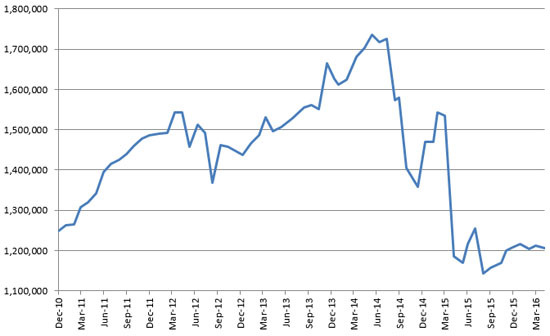 Bonanza continues to see consistent growth in the number of listings since I started tracking that data.